Options: 30lb 40lb. 50lb. 65lb 80lb. Berkley Trilene Braid is an Eight-Carrier Dyneema Radial Braid construction which is ultra round, smooth and strong. This braid is the choice of the pros because it is ultra strong, has longer casting, better handling, and is exceptionally quiet. 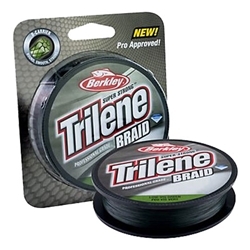 The Trilene Braid is the strongest braid made by Berkley EVER! It comes in Low-Vis Green and in 150 yard spools.